Drawing on recently declassified Soviet archival sources, The Concept of Neutrality in Stalin’s Foreign Policy, 1945–1953 sheds new light on how the division of Europe came about in the aftermath of World War II. This book contravenes the notion that a neutral zone of states, including Germany, could have been set up between East and West. The Soviet Union under Joseph Stalin was determined to preserve control over its own sphere in eastern Europe. 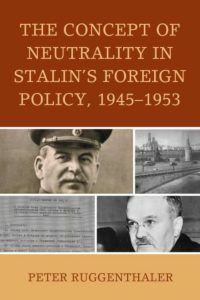 By tracing Stalin’s attitude toward neutrality in international politics, this book provides important insights into the origins of the Cold War. Journal of Cold War Studies, Vol. 19, 2/2017, S. 42-45.